As well as being embarrassed about the fact they are in your home, they also make pets' lives miserable, and humans begin to itch just at the thought of them. Vets are often asked what pill, drop, dip, collar, or shampoo works the best to get rid of these persistent parasites. The answer is that there is no single method or insecticide that will completely eradicate (or at least control) a flea problem. The flea life cycle is fairly complex, and understanding the various stages will make it easier to get rid of them. Collectively, all of the species of fleas are categorized under the order name of Siphonaptera. The cat flea, Ctenocephalides Felix, is the most commonly found flea in the US and infests cats, dogs, humans, and other mammalian and avian hosts. The adult flea is very flat side to side, with hair-like bristles on the body and legs to aid in their navigation through pet hair. 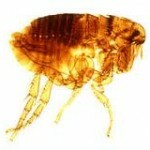 Fleas have 3 pairs of legs, the hindmost pair designed for their well-known jumping abilities. 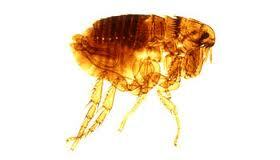 Adult fleas prefer to live on the animal and their diet consists of blood meals courtesy of the host animal. The female flea lays white, roundish eggs. The adult female flea can lay up to 50 non sticky eggs per day and then usually fall off the host pet and then onto carpets, rugs and beds. When the transparent white larvae hatch, they will feed on the feces of the adult flea for around 5 to 18 days (depending on conditions). The pupa is the last stage before adult. Stimuli such as warm ambient temperatures, high humidity, even the vibrations and carbon dioxide emitted from a passing animal will cause the flea to emerge from the cocoon faster. This brings us back to the adult flea….the entire life cycle is quite variable, as evidenced by the variability in each life stage progression. As mentioned above, the cycle can be as short as two weeks or as long as two years. That is why it is so important to remain vigilant, even when a flea problem is thought to be under control! biggest mistake mostly commonly seen is the lack of systemic control of the flea infestation. When you pet gets fleas, just a visit to the vets isn’t enough as you will no doubt leave fleas or eggs on pet beds, clothes, carpets or furnishings. Therefore a professional pest controller will need to ensure that all affected areas are dealt with, systematically and thoroughly. At Town & Country Pest Control, large and small flea infestations can be dealt with quickly with a wet spray or heat treatment. Prevention is with the use of flea collars and shampoos. Regular checks of your pets’ fur, plenty of vacuum cleaning and immediate intervention with a good medication from your vet, will help prevent an infestation in your home.